Sescoi will be partnering 360SDM located in Hall 15.1, E area, No.1 at the forthcoming Dental South China exhibition in Guangzhou. 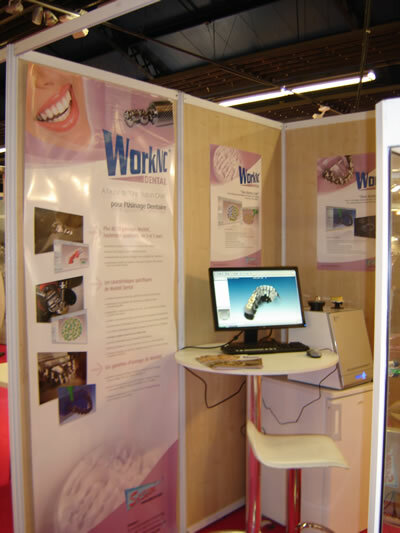 WorkNC®Dental, Sescoi’s automatic dental 3 to 5-axis CAD/CAM software, the EZ-Mill400® and EZ-Mill500® laboratory milling machines from 360SDM, and the scanning equipment and dental CAD software from Dental Wings® provide dental professionals with an easy to use, open system for the creation of prostheses from scanned data. Engineers from Sescoi and its partners will be on hand at the Dental South China show to demonstrate the process. Starting with the scanning equipment and dental CAD software from Dental Wings, implants, abutments and single, right up to full, arch models can be digitized and manipulated. WorkNC Dental imports the CAD model, nests it into the blank to maximize material utilization, and allows the user to add support pins to hold the prosthesis steady during machining. Automatic machining wizards within the software select the tools, machining methods, and feeds and speeds for the particular type of material being cut. Zirconia, titanium and chrome cobalt all require different cutting strategies and WorkNC Dental automatically optimizes these so that dental technicians do not need to be familiar with CNC machining to achieve the results they want. Within the software, particular importance is paid to the gum margin line which is automatically detected by WorkNC Dental. Accurate machining of this area is of particular importance for the success of the finished prosthesis. The software’s smooth finishing toolpaths ensure that the surface finish is of an extremely high quality, creating 5-axis movements where appropriate to get to all areas of the part and automatically find and drill abutment holes, irrespective of their orientation.Machining the prosthesis on the 360SDM EZ-Mill400 or EZ-Mill500 now becomes very simple. Safe toolpaths, which take account of the physical limits of the machine, are generated with one mouse click, and cutting conditions are automatically optimized to suit the implant material. By eliminating the need for dental technicians to have special CNC programming and machining skills, the open system offered by Sescoi, 360SDM and Dental Wings brings together the best solutions for each aspect of the digital manufacturing process, while keeping costs as low as possible.